Barbara Maggiolo (Venice, 1971) graduated in Architecture and attended the International Graphics School. She worked in several studios focusing on graphics, show-room design, fitting-out and image consultancy. Since 2002, she has been in charge of the marketing and communication strategy of Vistosi, which she directs in all of its phases, from the product to the advertising campaign. At Vistosi, she became familiar with the glass manufacturing techniques, which fascinated her. 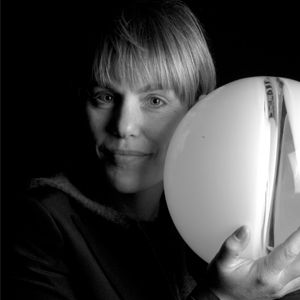 In the last ten years, she has been able to apply her graphic and design skills to the design of blown glass objects, which look for the perfect balance between an ideal pure form and the characteristics of handcrafted production.